For the first time, a bill passed the legislature that will provide major state funding for the project contingent upon approval of a difficult-to-get $300 million federal TIFIA loan. However, the project’s progress came at a price. CS HB 23 - OR archived copy here passed on the last day of session. The bill shifts all project management – bonding, permitting, and right of way acquisition – to the state Department of Transportation and Public Facilities (ADOT&PF). KABATA’s sole remaining function will be to collect tolls. For that reason, key legislators have openly implied that KABATA will be abolished next session. But for 2 missing pro-bridge votes in the House [ Dead link- this article is no longer online ], the state indirect guarantee for both the proposed $300 million state loan and an up to $500 million KABATA loan or bond to repay TIFIA, would have passed and KABATA would have remained in charge of the project. A House-Senate conference committee chaired by retiring Representative Alan Austerman (R-Kodiak) then produced a drastically different bill that removed all indirect moral obligation language behind the proposed TIFIA loan that was in the Senate version. Now only tolls and not the state, stand behind the proposed TIFIA loan. The final House approval of the new bill showed past bridge critics such as Republicans Reps Feige, Hawker, and Costello returning to the majority. As a result, the overwhelming House approval reflected the majority-minority split with only Democrats in the minority voting No. For futher details, see this Alaska Journal of Commerce article - OR archived copy here and this Frontiersman article - OR archived copy here. The legislature also passed a state capital budget with $55 million for the project, $5 million new money from the state to match $50 million of expected federal funds, which is close to the previously allocated funds left over from the 2005 Federal Earmark for the project. The ADOT&PF is likely to use some of those funds in the coming year to contract with a design and engineering firm to take the current 35% design to an approximate 65% design. The 65% design level should produce a more refined cost estimate for the overall project than the $894 million number given the legislature in March. However difficult it will be for the state to obtain a TFIA loan based only on toll revenue, this is the first time in four years that a bill was passed to potentially put the state’s credit behind the project by approving an up to $300 M state bond. One sign that the embattled project now looks more real than ever is that the last day decision of the legislature to back the project was front page news in the national publication Bond Buyer (behind paywall). The bill now goes to the Governor who is expected to sign it and so put ADOT&PF in charge of the project on July 1, 2014. With state support contingent upon a TIFIA loan for one-third of the project’s costs, the fate of the project now shifts from a political and priorities discussion among elected officials in the Alaska legislature to a more technical discussion of project credit worthiness between the state and TIFIA program officials at the federal Department of Transportation. To submit its first stage federal “Letter of Interest” application, the state will now have to provide the feds with the socio-economic study, the revised traffic and toll revenue study, and the new financial plan that was promised to the legislature last year but was not provided this session. The one page ADOT&PF – KABATA financial plan - OR archived copy here that showed no amount for toll revenue or bond payments will obviously be insufficient for the project to be considered by TIFIA. In his March 27, 2014 presentation to the Alaska Support Industry Alliance, KABATA Chair Michael Foster expressed great confidence that the TFIA loan would be approved if the Senate version of the HB23 passed. One state official has privately acknowledged that the socio-economic study to be done by Cardno and Agnew:Beck projecting population and jobs (an important first step in projecting traffic and toll revenues) has long been done but it would not be released by KABATA until after session. Even if the socio-economic study originally due 9/30/13 is finished, that study was to be used by KABATA’s discredited Revenue forecasting firm, CDM Smith to provide a revised traffic and toll study as the basis for a new financial plan. State debt manager Deven Mitchell and the Department of Revenue and not KABATA will now work with ADOT&PF to provide that financial information to TIFIA and this administration oversight may push consideration of the loan into the next TIFIA round. Over $40 billion in projects were submitted to TIFIA [ Dead link- this information is no longer online ] for the round that started August, 2012 and TIFIA commitments made since then may use up all of this round’s funding before Alaska submits its revised application. As a result, the fate of the project may well depend on the amount of funding in the next TIFIA around to be announced sometime after October 1, 2014. The TIFIA program has broad bi-partisan support but the program’s funding level is tied to the necessary renewal of the Highway Trust Fund. The Highway Trust fund - OR archived copy here has been described as the one piece of major legislation that both houses of congress will need to address prior to the November, 2014 elections. Because states and private partners have had trouble coming up with the two-thirds funding necessary for major transportation projects, there has been some congressional discussion about allowing the TIFIA program to loan up to 50% of a project’s budget. Even if, as expected, TIFIA funds are higher in the next round than current levels, that possible change to 50% federal funding would result in the usual 5-8 projects being financed out of approximately 40 submitted each round. It is also likely that boosting TIFIA funds may cause a reduction in federal transportation dollars that provides 90% of the funding for the vast majority of Alaska’s transportation projects, as well as making up one third of the proposed funding for the Knik Arm Bridge. 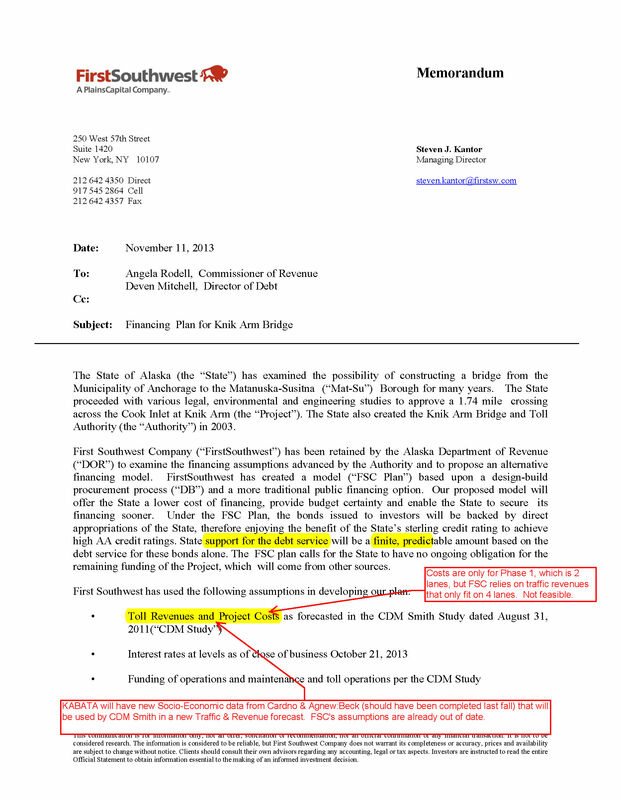 So it is likely that by the time the newly elected legislature takes office in January, 2015, the Knik Arm bridge project will have been turned down for funding in the 2012 round or is awaiting a decision in the new round that can be launched no earlier than the new federal fiscal year Oct 1, 2014. If KABATA was still in charge, that scenario could have predictably led KABATA, a single project state agency, to push for full state funding. Congress is expected to renew the Highway Trust Fund without raising federal fuel taxes; almost certainly they will not be raised prior to the November election. Because of a flattening out of miles driven nationally and improved vehicle mileage performance, states will continue to see a decline in federal formula funding. As a result, next year ADOT&PF with less federal formula funds, will probably have to identify projects that would be displaced or postponed indefinitely by the bridge. This year, ADOT&PF told legislators only that a bridge commitment would at most delay major projects by just 6 to 12 months. Project optimists can hope that a federal TIFIA loan commitment before Spring 2015 could have ADOT&PF presenting a financial package to the legislature for approval during the next legislative session. Individuals who are skeptics of federal TIFIA funding for one of the “Bridges to Nowhere” and who are keen observers of the past pace of TIFIA credit decisions, predict a slower pace on the Bridge decision. In that scenario it will not be until the 2016 legislative session that the legislature will need to face up to either abandoning the project or fully funding the bridge at 100% using state funds. None of the missing information delineated in our April 12, 2014 post was provided prior to the Senate vote. Also not provided was a considered analysis of whether the state’s credit rating could be adversely affected if KABATA defaults on its TIFIA loan. The TIFIA loan would not be a liability that the state is is obligated to cover, but KABATA is authorized to enter into agreements with the state for financing its project, and the specific terms of those agreements could drag the state’s credit rating into the picture. Either way, Alaska will be last in line for tolls to repay its state revenue bonds. The only successful amendment to the bill provided that property KABATA forcibly acquires through its power of eminent domain cannot be demolished prior to receiving a hard-to-get federal TIFIA loan for one third of the project costs. However, KABATA is free to demolish the homes and businesses it has already acquired, and it is free to continue to purchase more homes and businesses and to demolish them at any time. The bill headed back to the House on April 14, for concurrence, where it has now sat for over a week. The final large non-bridge issue to be resolved before adjournment is the additional education funding amount. That issue will be worked out in the House-Senate free conference committee on the state’s capital budget. In terms of the bridge, It is not clear if a vote in the House will be scheduled on the significantly revised CS HB 23 bill that passed last year. The original HB 23 was designed to move the bridge project to AHFC where AHFC would have reworked all of the numbers behind the toll estimates for a Public-Private partnership model. However, the new Senate bill keeps KABATA in charge of the project and abandons the public-private financing model in favor of building the bridge with public money only. Two pieces of information that emerged in the last few days suggest that it may be a struggle to pass a large capital project costing $894 million (KABATA estimate) in an extended session colored by talk of budget restraint and teacher layoffs. First, an article by Gregg Erickson in the © Alaska Budget Report (Used by permission), established that the draft 2015 capital budget’s commitment of $50 million in federal funds to the KAC represents 20% of next year’s federal transportation funding for the entire state (the state has been receiving about $250 million dollars a year in federal funds for the its transportation program). Erickson’s math appears to contradict the assurances of Department of Transportation Program Development Director Jeff Ottesen to the Senate Finance Committee. Ottesen stated that the $50M earmarked for the Bridge would represent no more than a 6-12 month delay in funding the existing pipeline of projects. The projects likely to be crowded out by the Bridge are listed in our April 11, 2014 post. State Debt Manager Deven Mitchell also testified to Senate Finance Committee that the tolls should be sufficient to repay the TIFIA loan after O&M costs are paid. So if, as expected, there was no further toll revenue to repay the proposed up to $300 million state loan, that would add another 10%-20% equivalent of annual federal transportation dollars for the project to Erickson’s estimate of 20% of 2015 federal funds. Second, an unanticipated amendment by Representative Les Gara (D-Anchorage) yesterday to strip $55 M for the Bridge out of the capital budget received some bipartisan support, failing 12-27. The $5 million state match represents “new money” for the project. The remaining $50 million is considered “old money” from the original federal earmark. Since bridge opponents did not lobby this item, the Republican support for this effort may reflect the heavy lifting required to pass a big ticket item such as CSHB 23 in the extended session. Other non-bridge capital budget amendments were turned aside largely on majority-minority lines. With nine days to go in the legislative session, CS HB 23 has moved to the Alaska Senate Floor. If CS HB 23 passes the Senate, it will next go to the House where the bill must pass if it is to become law before the legislature adjourns on April 20. CS HB 23 earlier passed the Senate Finance Committee with 5 approvals (Senators Meyer, Bishop, Fairclough, Kelly, and Hoffman) to 1 do not pass (Senator Olson). 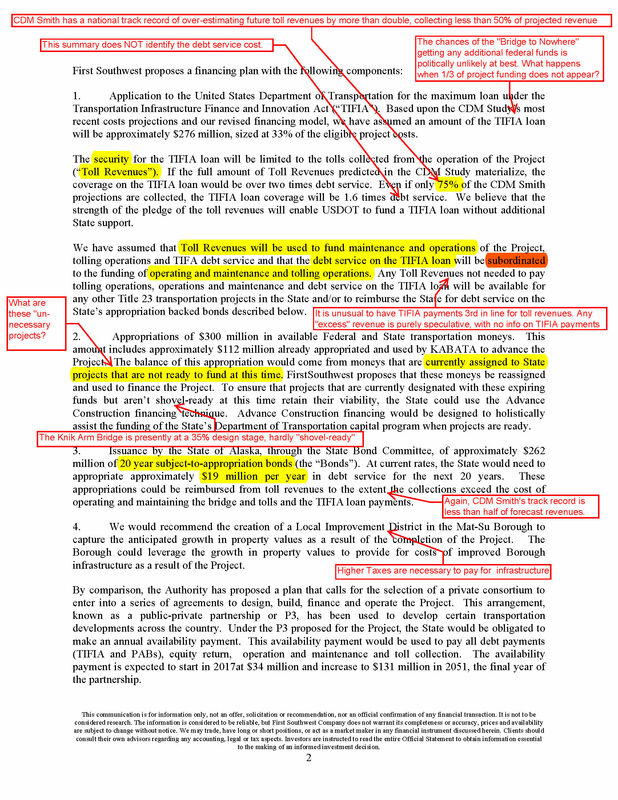 The only financial information provided the committee for what KABATA estimates as a $894 million dollar project, was a 1 page listing of funding sources which included a $251 million state revenue bond, existing and anticipated state and federal transportation funds of $226 million, $55 million from next year’s capital budget, and a $341 million federal TIFIA loan which must be obtained to trigger the state funding. The Bond Committee would have to approve the package. While traffic counts and expected toll revenue were discussed in two days of hearings at the Senate Finance Committee, at no point did KABATA or the State Department of Transportation produce any information on estimated toll revenues or any schedule of projected bond payments. As a result, there was no way for committee members to determine if the numbers added up. Although there were verbal references in testimony to less than 10,000 cars a day being needed to make the bond payments in the early years, no information was provided showing the traffic numbers necessary to produce the revenue to pay off the hoped for federal loan and the state revenue bonds. Using that one page plan from KABATA-DOT&PF and numbers from recent presentation of KABATA Chairman Mike Foster to the Alaska Industry Support Alliance, retired emeritus Professor Scott Goldsmith produced a spreadsheet (click here for Goldsmith spreadsheet and commentary by Jamie Kenworthy) showing that the Bridge would have a cumulative deficit by $242 million by 2034. The point of the Goldsmith exercise was not to define a cost for the project but rather to show that, even by KABATA numbers, the legislature would have to annually pay for the toll shortfall for the next 18 years. The Senate Finance Commission had much discussion about increasing traffic on the Glenn and that the Bridge could forestall the full cost of necessary Glenn improvements. Goldsmith’s spreadsheet included information from the latest Department of Transportation traffic counts showing that for the last three years traffic between the Mat-Su Valley and Anchorage has not increased. As 5 people who testified to the Committee pointed out, KABATA has not produced the new demographic data, traffic and toll projections and financial information promised by KABATA after last April’s highly critical Legislative audit. The audit stated that KABATA’s predictions were “unreasonably optimistic.” Further confirming that KABATA’s projections were “unrealistically optimistic,” two more recent projections performed for the Department of Transportation for tolled traffic, resulted in numbers that are 50% and 74% lower than KABATA’s old unrevised numbers. If (When?) Tolls Fall Short Will KABATA Default or Will the Legislature Make Up The Toll Shortfall? Questions from Senator Ellis (D-Anchorage) to the Department of Revenue and the Attorney General’s office asked what would happen if toll revenues proved insufficient to repay the proposed TIFIA loan. Assistant AG Jeff Stark denied that one particular section of the bill constituted a moral obligation of the state. But the confusing cross references of “toll bridge reserve fund” “bond redemption fund” and “bond reserve fund” appears to extend the clear responsibility the State would have for the $300 M fund to also include any bond or loan KABATA might approve. By their nature, so called “moral obligations” are a guarantee not written in the statute but CS HB 23 contains the customary language citing “reserve funds” and obligations to report any shortage of necessary funds to the legislature which are the customary tools of establishing a moral obligation for the state to have to back up the debt issued by its own agencies. Bob French marked up CS HB 23 showing a number of questions about how the reserve funds would actually work. Click here to view the marked up version. No Alaska state agency has ever defaulted on its obligations, whether to investors or the federal government. But most bond professionals are quite skeptical of Stark’s assurance that there would be no impact on the state’s credit rating from a KABATA default on the proposed $341 million loan. What is a more likely scenario say bond authorities, is that when toll revenue proves insufficient, the legislature will annually make up the shortfall rather than risk a credit downgrade and higher interest rates having to being paid by the state and local units of government. That expected scenario of the “blank checks” embedded in CS HB 23 was the topic of Scott Goldsmith’s testimony to the Senate Finance Committee. There was little discussion by the Senate Finance Committee that under the new public finance structure of CS HB 23, as opposed to the old public-private partnership model KABATA pushed last year, the state will now be responsible for all cost overruns. So what projects will be crowded out by the Knik Arm Bridge? Department of Transportation Program Development Director Jeff Ottesen reassured the Senate Finance Committee that in making room for the Bridge in the state’s adopted transportation plan would bring at most delay of 6-12 months of some projects and the only canceled projects were ones that will no longer be necessary, such as those improving the ALCAN highway bridges, since all gasline discussions now focus on an in-state line to Valdez or Cook Inlet. However, the Department of Transportation now has out for public comment, the amendments necessary to accommodate adding the Knik Arm Bridge to the transportation plan. That information makes it possible to identify the canceled or postponed projects that will be immediately affected if CS HB 23 passes and those projects are spread across the state. Click here for a list of the canceled and postponed projects. Federal transportation law requires the changed approach to financing the Knik Arm Bridge to be reflected in the Statewide Transportation Improvement Program (STIP) for 2012-2015, previously approved by the federal government. 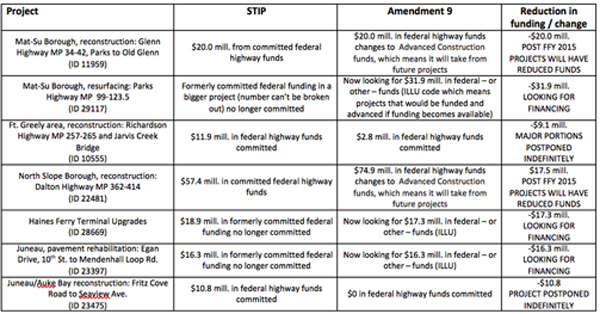 Any major change to the STIP via an amendment must ensure that the cost numbers balance, known as “fiscal constraint.” The revised Knik Arm Bridge financing which underlies CSHB 23 requires changes to other transportation projects in the existing STIP, including postponement of construction, cancellation of project components, accounting measures that ensure other projects in the future will have to be cut back, etc. Amendment 9 to the STIP is now out. Based on the contents in the amendment, it’s clear that highway projects in the Mat-Su Borough (Glenn and Parks Highways), near Ft. Greeley, along the Dalton Highway in the North Slope Borough, in Haines, and in Juneau are likely to be significantly and adversely impacted. See the chart below. Some of these projects will have to find new federal or state funding in the future. Click here to view the full size document. Ten major transportation and energy capital projects planned by the State of Alaska could cost up to $17.7 billion and would nearly quadruple Alaska’s debt service, says a new report by engineer and transportation expert Lois Epstein. “State leaders need to decide if it makes fiscal sense to proceed with all of these expensive projects, especially given their limited returns on investment,” said Epstein, who is arctic program director for The Wilderness Society and previously directed the Alaska Transportation Priorities Project, a non-profit transportation watchdog organization. The 10 projects and their costs are shown in the chart below, and on the second page of Epstein’s report, which is available here. “The state has in hand only eight percent of the money it needs to build these 10 projects,” Epstein said. “With oil revenue in decline in the near-term after passage of SB 21, a law cutting taxes on oil production, we need leadership in Juneau to serve as a check on the governor and to prevent unwarranted projects from becoming burdens to the state for decades to come. Legislators should fund ‘needs’ like education and repairing crumbling infrastructure before funding ‘wants,’” she added. 1)	Pursuing only major road/bridge projects that address key transportation needs, e.g., increasing safety, reducing congestion, fixing deteriorating infrastructure, and addressing air quality problems. 2)	Not starting projects that do not have the financial resources to be finished. 3)	Not letting project momentum obscure the need to re-evaluate projects when adverse facts become available. After two days of testimony last week from only those state officials who support the Knik Arm Bridge, the Senate Finance Committee will resume deliberations this week on a new one page financing plan. Click here to view the plan. KABATA’s new estimated cost for Phase I of the Bridge is now at $894 million. The new bill CSHB 23 - OR archived copy here, authorizes $300 M in state bonds for the Bridge, counts on a $341 M low cost fed TIFIA loan that KABATA has been turned down for six times as well as $226 million in new federal funds above currently anticipated future federal transportation funds. For press accounts of the committee’s deliberations see Lisa Demer’s two articles in the Anchorage Daily News: New Funding Plan for the Knik Arm Bridge [ Dead link- this article is no longer online ] and Legislators Hear New Knik Bridge Financing Plan. [ Dead link- this article is no longer online ] Also see Pat Forgey’s article in the Alaska Dispatch, Legislature Considers Restructured Knik Arm Bridge Plan, Minus ‘the Middleman’ - OR archived copy here. The Finance Committee listened closely to Municipal Bond Bank director Deven Mitchell as he estimated the state’s maximum liability for the project to be $450 million for the $251 million state revenue bond issue and $200 million of interest payments. Mitchell is well respected and considered a credible defender of the state’s AAA credit rating. Does section 37.15.255 (g) of CS HB 23 threaten the state’s credit rating? However, the language of this section is considered by bond attorneys to be standard “moral obligation” language that commits the state. If, because of insufficient toll revenue, the legislature refused to appropriate the necessary funds for the federal TIFIA loan payments, the first ever default by a state agency would result and the state’s credit rating could then fall below investment grade. As described by Deven Mitchell, any toll revenue would be allocated in the following order: (1) Operations and Maintenance of the bridge (2) Pay off the hoped for $341 million federal TIFIA loan (3) Pay off the up to $300 million state revenue bond. The state’s moral obligation has never been tested. In the past, if AIDEA or AHFC projects failed, those state agencies had sufficient profits and reserves to make the payments on agency paper. KABATA is a one project state agency and “if” (more likely “when” project critics say) the toll revenues are insufficient to pay off the federal loan, then the legislature would have the tough choice of either reneging on an agency obligation or coming with whatever amount is requested by the administration for the bond reserve fund. If the state reneges, the state’s credit rating would be lowered which would raise the cost of financing for the remainder of the state and local units of government. The standard term sheet for federal TIFIA loans [ Dead link- this information is no longer online ]requires an investment grade rating from at least two national rating firms for any funded project. How can this project earn an investment grade without directly pledging the state’s credit? The predictable dynamics of Section g of CS HB 23 threatens the state’s credit rating and puts in place an unlimited obligation for the legislature to perpetually replenish the bond reserve fund. Where are the New Numbers KABATA promised? KABATA used transportation dollars to buy statewide media promising a “fresh start” for the project and promising that the new data that would be “peer reviewed.” The KABATA Executive Director on August 27, 2013 also signed an agreement with the Anchorage Metropolitan Area Transportation Solutions (AMATS, the state/Muni Anchorage regional planning organization ) agency to share projected population, household, and job forecasts and coordinate this demographic data to aid regional planning. To date, no new population and employment forecasts, nor the Toll and Revenue forecasts based on that population and employment data have been released to AMATS, the legislature, or the public. After the skeptical LB&A audit, will the Senate Finance Committee approve a project guarantee and $300 M revenue bond authorization without seeing the promised new demographic and financial information? By approving CS HB 23 the legislature would in effect warrant the accuracy of the KABATA’s current traffic and toll revenue forecast which the legislature’s LB&A Committee has severely criticized. Will 36,000 vehicles a day cross the Bridge in 2035 or just 9,400? A $250,000 a day/$90 million a year difference in toll revenue. KABATA has not completed the Toll and Revenue forecasts they promised. However, last year the consulting firm HDR as part of the Wasilla bypass project for the Mat Su Borough and the state DOT&PF, updated Mat-Su population and employment numbers and projected 2035 traffic on Mat-Su roads using data from the 2010 Census. A Public Records Act request to the Alaska Department of Transportation and Public Facilities uncovered HDR’s estimate of 9,400 vehicles a day crossing the Bridge in 2035; KABATA’s last prediction for 2035 was 36,000 vehicles a day. The Highway to Highway project in 2009 projected half that or 17,700 trips. Click here - OR archived copy here to view the HDR distribution map of the 9,400 daily trips. HDR also projected there would be only 1249 jobs at Point MacKenzie in 2035, the northern terminus of the proposed bridge. KABATA’s last estimate for Point MacKenzie jobs was 10,455 or more than 8 times as many. That high number drove a extremely high toll revenue estimates that would be used pay off the bonds. Based on KABATA’s estimate of a one way $7.80 car toll and a $28 truck toll in 2035, the 26,600 difference in vehicle trips (36,000-9400) amounts to a difference of over $250,000 a day or $90 million a year in 2035. At the March 13, 2014 AMATS Technical Advisory Committee meeting Jamie Kenworthy distributed maps comparing KABATA, AMATS and HDR Numbers showing the large difference between population and employment numbers from the 2011 AMATS and 2013 HDR reports on the one hand and KABATA’s much higher numbers generated in 2011. A representative of the state Department of Transportation found the HDR-KABATA comparison misleading since the HDR numbers were just done for the Wasilla bypass and are not a regional forecast. However, Kenworthy believes the forecast is the best bridge forecast yet since HDR’s was the only traffic projection to use 2010 Census numbers and recent Alaska Department of Labor data to update neighborhood population and job data and then correlate the new data with existing traffic counts before making the updated traffic projections. The new HDR forecast is awkward for the state both because of the large difference in numbers between the new lower HDR numbers and the old higher KABATA numbers and because HDR is also a current KABATA contractor. In considering the reliance on toll revenue to repay the proposed KABATA bonds, will anyone in the legislature notice the large discrepancy of traffic numbers? Will the Bridge Cost $894 million, $1.6 Billion or More? The new 1 page public finance plan handed out to the Senate Finance Committee estimates the cost of a 2 lane Bridge and 2 lane northern approach roads at $894 million. The last Bridge cost number from KABATA was $1.6 Billion for a 4 lane Bridge. KABATA needed to show the higher $1.6 billion number in their December, 2012 submission to the LB&A audit since the KABATA plan showed the revenue from 4 full lanes of traffic in their financial plan. KABATA had earlier shown a $400-500 million additional cost for Phase II which includes a 4 lane Bridge and approach roads. The new finance plan for the Department of Revenue from consultant 1st Southwest counted on only 3/4 of the revenue projected from KABATA’s traffic and toll consultant CDM Smith. But those plans still only showed the cost of a 2 lane Bridge and the revenue from up to 40,000 vehicles a day. However, 20,000 to 22,000 vehicles a day are considered the maximum capacity on a 2 lane restricted highway. The Department of Revenue refused a January, 2014 request for 1st Southwest to release to the department and the public the backup spreadsheet behind the $50,000 4 page report that identified the new public finance option. The one page funding sheet handed out to members of the Senate Finance Committee had no backup spreadsheet showing the amount and timing of toll revenue and bond payments so the Committee had no feasible way to determine if the numbers add up. Will any legislators note that the new plan probably continues to rely on 4 lanes of tolled traffic crossing a 2 lane Bridge and then request a backup spreadsheet showing the timing of toll revenue and state bond and federal TIFIA repayments? What are the legislators’ real priorities? With an up to $2 Billion shortfall in revenue next year and a proposed equity stake in the proposed gas line, the end of session will reveal the state’s true priorities. While there are no recently released polls on the Bridge, a January, 2014 survey of Anchorage business leaders [ Dead link- this survey is no longer online ] done by the McDowell Group for the Anchorage Economic Development Corporation put the Knik Arm Bridge near the bottom of the list of important projects. Ahead of the Bridge was the state budget, Cook Inlet resource development, the gasline, neighborhood safety, affordable housing, workforce training, Port expansion, Pebble Mine, and the Susitna-Watana Dam. It is clear that the state cannot finance all the major projects under consideration. 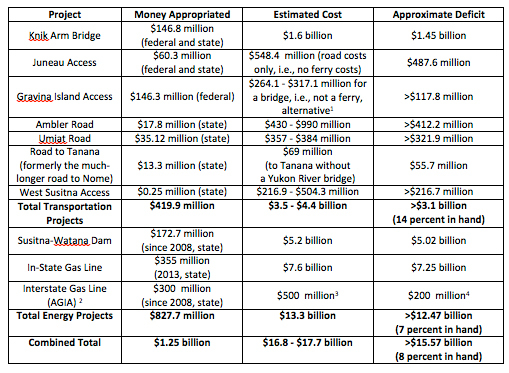 A new report totaled the costs of the Knik Bridge, the Juneau Road, the road to Tanana, the road to Ambler mining district, and the Susitna-Watana Dam and concluded that the state has in hand only about 8% of expected funds to build all projects. If all projects were approved the state’s debt service would quadruple. It is also not clear if the House and Senate priorities will differ and whether those differences will be resolved prior to the session’s scheduled April 20 adjournment. The media has yet to notice a key difference between the KABATA bill which passed the House last April and the substitute for that bill heard in Senate Finance last week. After the audit the House Republican leadership had such little faith in KABATA leadership that the HB 23 they passed took the project from KABATA and move the project to AHFC where then AHFC Executive Director Dan Fauske pledged to redo the numbers on his own schedule. The Senate Finance substitute bill prohibits termination of KABATA and would keep KABATA in charge of the project until all project bonds had been paid off which presumably would be 25-30 years at a minimum even if the state and not toll revenue were used to make the payments. Will KABATA remain in charge of the project and where will the Bridge fit in overall legislative priorities? In the last two months KABATA Executive Director Andrew Niemiec has resigned, two competing financial plans are now in play, and none of the KABATA promised backup from their “new” socio-economic data has yet been made public. Last month Revenue Commissioner, KABATA Board member, (and former First Southwest Senior Vice President) Angela Rodell released a new finance plan from consultant First Southwest Company (FSC) that showed a lower project cost than the public-private partnership plan (P3) that KABATA has pushed for over seven years. Click here [ Dead link- this article is no longer online ] for Lisa Demer’s Anchorage Daily News article which discusses the FSC plan. Consultant First Southwest contrasted KABATA’s plan for a P3 project that had a maximum state payment of $3.2 Billion project being paid off in 35 years, with a direct state bonded project with a $689 million maximum state payment and no private partner, being paid off in 18 years. The First Southwest plan, click here, [ Dead link- this plan is no longer online ]has the state appropriating $300 million up front. That amount is not included in the current list of state Department of Transportation projects. Instead, First Southwest calls for the $300 million to be diverted to the bridge from other state transportation projects. Both the KABATA P3 plan and the FSC plan count on about $300 million in a low interest federal TIFIA loan that KABATA has now been turned down for 5 times. Furthermore, the First Southwest plan envisages that a TIFIA loan would be backed only by expected toll revenues. No recent federal awards have been made without a public or private backing for the TIFIA loan. First Southwest was paid approximately $50,000 to produce the four page plan which included no spreadsheet or backup analysis to show the timing of toll revenue, debt payments, and obligations. For a critique of the First Southwest Plan by financial analyst Jamie Kenworthy sent to Commissioner Rodell on January 7, 2014, click here. The Department has yet to reply to that analysis, nor have they yet indicated whether any backup financial spreadsheets were provided to the Department or whether they consider the $50,000 contract now complete. Governor vs Legislative Project Proponents? Governor Parnell and the leading legislative proponents of the project may have different views of which plan should be pushed forward. In an Anchorage News interview, click here, [ Dead link- this interview is no longer online ] the Governor indicated he preferred state bonding to the P3 structure since it would be lower cost and the P3 market had changed. Because Alaska has AAA credit, the state can borrow at lower cost than the Bridge contractor, and the First Southwest plan has the state putting $300 million in an up front “down payment”, the Governor is probably correct that the First Southwest Plan lowers the project’s cost. However, because the state now instead of the private contractor will be responsible for toll collections and maintenance, operating costs will be higher and those extra costs were not mentioned in the First Southwest plan. However, the claim from the Governor and bridge proponents that “the market has changed” is curious reasoning to apply to the Alaskan project. Based on past bills submitted by KABATA, no contractor has ever been willing to take the risk of financing the project without a state guarantee to make up for expected toll shortfalls. With the recent bankruptcies of national P3 projects due to unexpected toll shortfalls, the market has in effect now come to the position Alaskan contractors and KABATA have held all along – state guarantees are required. Click here - OR archived copy here - for an Alaska Dispatch article for additional detail. 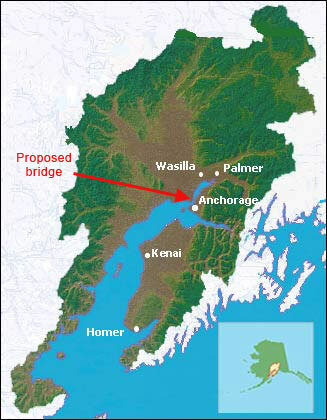 Chief legislative bridge proponents, Mat Su legislators Senate President Charlie Huggins and House Finance Member Mark Neuman, according to the Alaska Dispatch article, - OR archived copy here - still favor the P3 approach and seek to keep KABATA in charge of the project. However, the House-passed bill from last session moved the project to the Alaska Housing Finance Authority. No word has yet come from the legislature on whether or not new bills will need to be filed to accommodate the new public finance plan. The debate over the two finance plans has made clearer that a dollar spent on the bridge is not available for other transportation projects. With a predicted dramatic drop in state revenues, it is not clear if a majority of both houses has the will to finance such a big ticket item in an election year. 1. Where’s the new Finance Plan? KABATA bought statewide media last year to publicize getting new “independent” socio-economic data after the Legislative, Budget and Audit Committee (LB&A) criticized the undocumented and optimistic old data behind KABATA’s “unreasonably optimistic” traffic and toll projections. The new contractors, Cardno and Agnew:Beck were scheduled to finish producing new population and employment data by December 1, 2013. Then CDM Smith — the holdover traffic and revenue consultant heavily criticized in the audit — would then massage that socio-economic data to produce a new toll revenue forecast, and Citigroup – another holdover consultant – is then expected to release a new finance plan for the project. Will the Senate or its committees hold hearings and vote on a KABATA bill without seeing a new finance plan based on the new data? 2. How different will the AMATS and KABATA numbers be? Future population and jobs predictions are closely related to traffic and toll projections. The higher those projected traffic and toll numbers, the lower the Bridge can be projected to cost the state. Last month, state demographer Eddie Hunsinger estimated that the Mat-Su Borough has grown an average of 2.35% a year since the April, 2010 Census. Click here [ Dead link- this information is no longer online ] to view the figures. At that rate, the Mat-Su will have 155,000 people by 2035. In December’s announcement of a new proposed town site near the bridge, Mat Su officials were apparently trying to show a potential scenario with high population density to justify optimistic bridge traffic projections. According to an Anchorage Daily News article (click here) [ Dead link- this article is no longer online ] questions on how the sewer and water infrastructure for the denser development would be paid for were ducked by local officials. KABATA and the Muni of Anchorage now have a signed agreement to share socio-economic data. Because AMATS receives federal transportation planning funds, the bridge must have consistent cost and socio-economic data to fit with the 2035 AMATS adopted transportation plan. For the last 4 months KABATA has declined to brief AMATS on its data and plans. But KABATA acting Executive Director Judy Dougherty is scheduled to brief AMATS on February 13, 2014. Will the new KABATA numbers be consistent with AMATS numbers and risk showing too little toll revenue to justify the state’s cost estimate? Or will KABATA again have higher population, job, and toll numbers and be inconsistent with the Anchorage-adopted transportation plan? 3. Why does the state plan from First Southwest show the revenue from 4 full lanes of traffic crossing a 2 Lane Bridge? The First Southwest plan shows a $706 million cost for a 2 lane Bridge. But the plan is also based on 20 years of CDM Smith’s 2011 revenue projections which shows 36,000 trips a day when the maximum a restricted 2 lane highway can handle is 20,000 trips a day. (The Glenn Highway today carries about 30,000 trips a day between Mat-Su and Anchorage.) In December 2012 when KABATA had to give the LB&A auditor a finance plan, it showed a four lane bridge and approach roads with a total project cost of $1.6 Billion, not $706 million. Will there be one media article or legislator to raise the issue that the new state plan STILL relies on the cost of 2 lane bridge with the revenue from traffic that can only fit on 4 full lanes? 4.What is the fate of KABATA’s remaining funds? To date, KABATA has spent about $80 million with about $35 million of federal match remaining. The Governor’s FY2015 budget request for $55 million for KABATA included those federal funds. In a session likely to be dominated by talk of austerity and cutbacks, if at some point legislators decide they do not wish to provide the state guarantee required under either bridge plan, the leftover $35 million could be put in play. Those formerly earmarked federal funds are now state funds and can be spent on any eligible transportation project. Former Government Hill Community Council President Bob French in his remarks to the Anchorage legislative caucus, highlighted both the project’s confused status and the choices ahead for the legislature, click here to read the remarks. If the project does not receive the state guarantee to move forward, is this the year when the KABATA funds are reallocated to projects which can be built to meet existing transportation demands? Or is it more likely that KABATA will continue to exist for a few more years spending the last of the earmarked funds on salaries, consultants, and PR? Bob French attended the Anchorage Caucus Public Hearing on January 11, 2014, and was asked by several law makers to follow up by outlining his criticism of the First Southwest plan for public financing of the Knik Arm Bridge that has been taken up by Gov. Parnell. Thanks for listening at the Pre-Session Caucus. Please feel free to contact me or Jamie Kenworthy if you have any questions or comments. With 3 different and conflicting “visions” for KABATA, currently before the legislature, one thing is evident, there will be new opportunities to determine the future of the Knik Arm Bridge, and if it moves forward, to shape the state’s liability for it’s financing. Those visions are expressed by: HB 23 transferring the bridge to AHFC, but still a Public Private Partnership (P3); SB 13 being the original version for the P3; and the latest Public Financing version that is apparently supported by Gov. Parnell, based on a plan by First Southwest Corporation (FSC). Since the FSC version is pretty new, here is some background. FSC’s recommendations came from a $50,000 contract with the Department of Revenue. In contrast to the dozens of pages of financial spreadsheets and hundreds of pages of backup information that KABATA has available, FSC’s November 11, 2013 report has only 4 pages. We used a PRA to request the backup spreadsheets, but were told that “No backup spreadsheets or financial analysis were provided to Revenue, just this summary.”. A highlighted version of those 4 pages is attached, with many important comments and questions, but it is evident that a lot more detail would be needed to provide the Legislature with an actual financial plan, which will certainly be necessary for the TIFIA application. So look for that info in the future. Some considerations: Traffic forecasts are still critical. Imagine having as much traffic hitting the A-C Couplet Downtown as the Glenn Highway currently sees beneath the Eklutna overpass only 14 years after bridge opening. That is the scale of the traffic predictions that FSC accepted for their study. Obviously, impacts to Downtown will be substantial, and not mitigated by KABATA. If that amount of traffic does not show up, then toll revenues are unlikely to be enough to pay back the bonding. KABATA has spent a lot on what they are touting as an “independent review” being done by Cardno/Agnew:Beck that was supposed to have been completed this fall. That “new” Socio-economic data will then be turned over to CDM Smith to produce a revised Traffic & Revenue forecast. So, not only are the revenue forecasts that FSC used already out of date, the new forecast will still have been done by the same discredited firm that has a track record of having less than half of the forecasted revenues being achieved. The same CDM Smith who provided the T&R forecasts for at least 4 toll projects “Outside” that have gone bankrupt, or required major refinancing. My name is Bob French and I am speaking for myself. I have been concerned about the effects of the Knik Arm Bridge on state finances for many years. Governor Parnell has apparently decided that giving an additional $600 million of state guaranteed profits to the bridge builder was not a great idea. Unfortunately the state financing plan proposed by the First Southwest Corporation, still has many of the same fatal flaws of KABATA’s P3 plan. The 1st SW plan is still relying on toll revenues to pay for all operations and maintenance costs as well as paying back a $276 million dollar TIFIA loan. Unfortunately 1st SW just accepted CDM Smith’s toll revenue forecast that was described as “unreasonably optimistic” by the legislative audit. KABATA’s forecasted toll revenues won’t happen if new growth in the Mat-Su Borough is based on individual well and septic systems, it can only happen with centralized water and sewer systems. Another major concern I have, is KABATA pulling a “bait and switch” on the Legislature. That is, getting the Legislature to guarantee payments based on “potential” future sources of funding, and then needing to change to more expensive funding, with the resulting higher payments still being guaranteed by the state. That is still the case with public financing of the bridge. What happens if the Legislature doesn’t shift $300 million dollars for existing planned transportation projects over to KABATA? If the legislature can’t decide on those suddenly “un-necessary” projects, where is that $300 million coming from? What happens if KABATA is turned down by the feds for a 6th time for the $276 Million dollar low-interest TIFIA loan? Even if they get the TIFIA loan, CDM Smith has a track record of less than half of the toll revenues they predict, actually showing up. What happens when tolls are not enough to pay back those loans? Most importantly, does the legislature have veto power, if either the construction or financing costs turn out to be much higher than what you are being told right now? Can you stop the project before it bankrupts the state? Many folks here today are asking for additional funding. I’m asking you to disband and cut all funding to KABATA, and use the remaining $55 Million to fund needed transportation projects. Because of time constraints, I obviously couldn’t provide a long summary. Click here for a more detailed critique from an e-mail from financial analyst Jamie Kenworthy to Commissioner Rodell from last week. Jamie Kenworthy asked the Department of Revenue several questions and made several comments following the Mid December public release of the four page “Financing Plan for Knik Arm Bridge” that was created for the DOR through a contract with First Southwest Company. As of the date of this posting, there has been no response to this e-mail from the Dept. of Revenue. 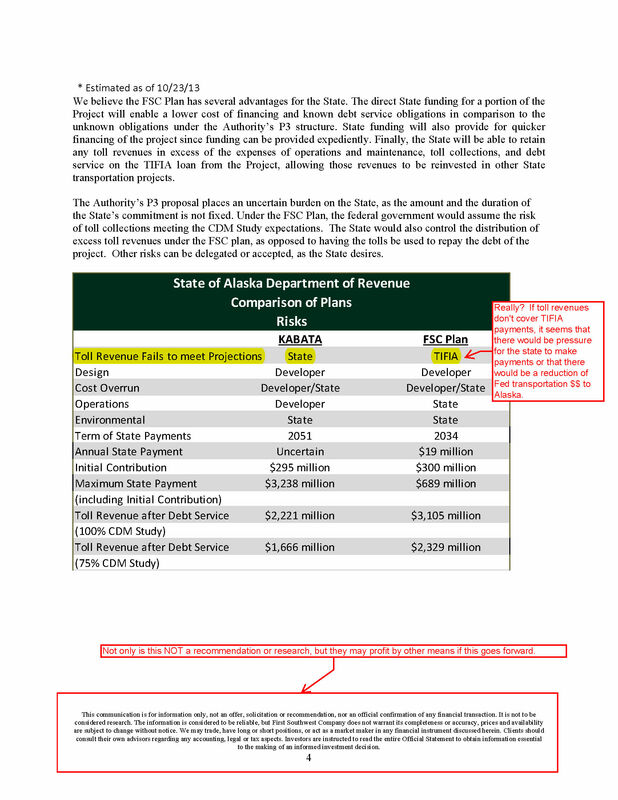 What follows is an analysis of the 11/11/13 First Southwest memo to you on the proposed public financing plan for the Knik Arm Crossing. In initial conversation with Lacy Wilcox of your department, it is not clear to me whether the 11/11/13 memorandum represents the final work product for the Department of Revenue on this $50 K contract to First Southwest or whether the issues identified below can still be addressed. The plan utilizes the same employment and population data which was identified as overly optimistic by the Legislative Budget and Audit Committee’s Audit. CDM Smith’s documented national record is to overestimate traffic and toll revenue by 118%. The plan’s entire financial foundation is predicated upon unrealistically high toll revenues to cover operational costs, bond servicing, and TIFIA loan repayments. The plan perpetuates the egregious error of including four lanes of toll revenue while accounting for the cost of only a two lane bridge. To correct that error, either $500 million for the additional two lanes needs to be added to the cost or toll revenue needs to be reduced by $674 million (45%) over twenty years. It is not clear why First Southwest argues a major feature of the FSC Plan is lower interest rates than the Public Private Partnership (P3) structure if the FSC Plan also requires a $300 million down payment from the state or over 40% of the alleged project cost. Because of these issues and because no spreadsheet or backup financial calculations that appear to be deliverables in the Department’s RFP were included in the 11/11/13 memorandum, I think it is hard if not impossible to determine what the cost of the project with the PSC Plan will be within any acceptable range. The FSC Plan uses a $706 million cost for a 2 lane Bridge and 2 lane northern approach road. 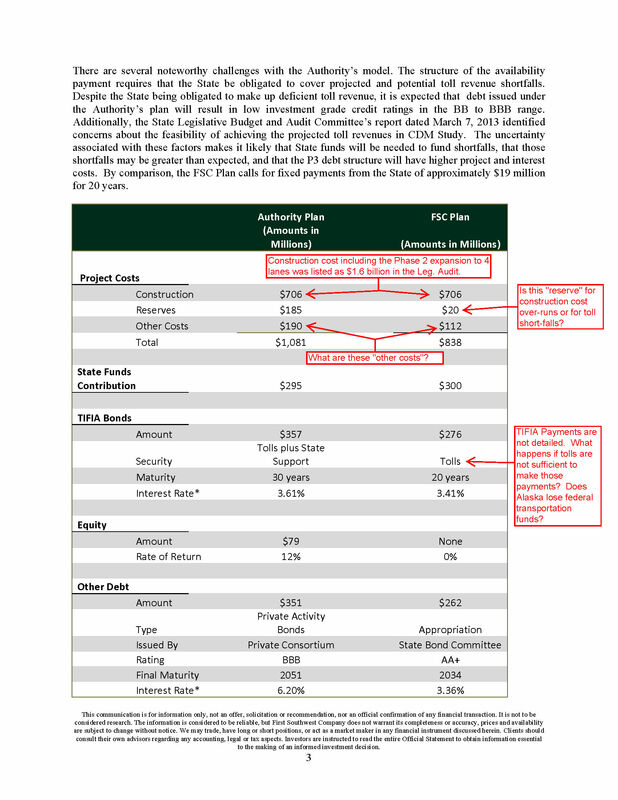 But the August, 2011 CDM Smith revenue base forecast (p. 33) which FSC Plan uses, includes revenue from 4 full lanes of tolled traffic on the Bridge in the ninth year the Bridge opens. By bridge year 9 CDM Smith shows revenue from 21,100 vehicles a day which is over capacity on a restricted 2 lane highway; by year 20 CDM Smith shows revenue from 36,000 daily tips, 6000 more than Mat-Su-Anchorage trips at Eklutna Flats on the 4 lane Glenn Highway today. How are 36,000 daily trips possible on a 2 lane Bridge? Either at least $500 M needs to be added to cost to build a 4 lane Bridge (plus more for 4 lanes northern approach) or no revenue can be shown on a 2 lane Bridge over at most 20,000 trips a day. If the $706 million 2 lane Bridge cost is used with a maximum 20,000 daily trips capped at year 8, that reduces toll revenue by $674 million or 45% over 20 years per CDM Smith numbers. This basic 2 lane/4 lane problem is why KABATA in December, 2012 submitted a $1.6 billion bridge cost to be included in the LB&A audit. The FSC plan says even if toll revenue is 75% of CDM Smith’s projection, the bond cover ratio is a comfortable 1.6. But CDM Smith, per the Transportation Research Board data, has a national track record of overestimating revenue by a 118% (see http://knikbridgefacts.org/kabata-traffic-consultant-has-average-118-overestimation-error-rate-for-us-projects/ ) or more than a factor of 2 for the first years tolled projects were open. That 2 times overestimation is consistent with Smith’s estimate of 2035 daily Bridge traffic of 36,000 trips a day versus the Highway to Highway number from CH2MHill using ISER data of 17,700 trips a day. So without fixing the 2 lane of cost-4 lanes of revenue problem, even a more realistic 50% factor on CDM Smith revenue estimate puts the minimum bond cover ratio at 1.07 or way below the investment grade ratio necessary to sell state or TIFIA bonds without a state guarantee. The FSC Plan projects a $276 million low interest federal TIFIA loan based only on toll revenue. Can First Southwest identify one successful federal TIFIA award to a toll project in the last five years that was not backed by a public or private guarantee or both? The Knik Arm Crossing project has now been rejected 5 times for a TIFIA loan; without a public guarantee to cover the toll shortfall the sixth TIFIA application will almost surely meet the same fate. Why Wasn’t Information from the LB&A Audit and Latest Socio-Economic Data Used? The LB&A audit had some concrete findings as to the overly optimistic population and employment projections that underlay the P3 financial projections. (It should also be noted that the numbers for operations, maintenance, and toll collection which First Southwest relied on came from KABATA and Citi, not CDM Smith.) Without consulting the audit work of independent traffic consultant Timothy James, how is it possible for First Southwest to examine the “credit worthiness” and “underlying economics” of the project? Since KABATA has contracted with Cardno and Agnew:Beck for new socio-economic data that was due 11/30/13, when First Southwest completes its final financing plan, would it not make sense that the new population and employment data be used by a truly independent firm to estimate toll revenue? How will the different elements of the FSC Plan be sequenced? Is the legislature to commit to a 20 year $262 million bond but if the TIFIA loan does not materialize then the state bond amount will be increased to about $540 million? Without a detailed “amortization schedule” (deliverable #5 in the Department of Revenue RFP) and “detailed financial calculations” and bond cover ratios (deliverable # 3 in the RFP) it is hard to understand how the Plan adds up and predict what the final cost to the state will be. Just listing the two plans of finance on p. 3 of First Southwest 11/11/13 memorandum does not appear to meet the evaluation of amortization schedules for the two scenarios promised in deliverable # 5 and # 6. Since the state putting down $300 million up front significantly lowers interest costs in any scenario, at a minimum a net present value calculation on that down payment should be part of any fair evaluation of P3 vs state finance scenarios. The wording of the RFP deliverables appears to require the contractor to show their financial work. I hope the above issues can be addressed before a final report from First Southwest is accepted by the Department of Revenue. Thank you for any consideration these comments receive. Was KABATA Traffic and Toll Consultant CDM Smith Keeping 2 Sets of Books to Hoodwink Oregon Legislators? A multi-year wrangle between Oregon and Washington over financing of a new I-5 Bridge has now put the spotlight on the activities of CDM Smith, traffic and toll consultant to both the I-5 Bridge project and the Knik Arm Bridge. Smith had estimated that 160,000 vehicles a day in 2016 would cross the I-5 Bridge between the two states. However, a recent public records request to Oregon state government unearthed an “investment grade” number also provided by CDM Smith showing the bridge in 2016 would carry only half that traffic projection or 78,400 vehicles a day. Click here (- OR archived copy here) and here (- OR archived copy here) for the Portland articles. Accusing CDM Smith of “keeping two sets of books,” an Oregon Republican legislator expressed anger at Oregon’s Democratic Governor for not disclosing the more pessimistic toll revenue projection to the legislature on the $2.8 Billion project when more realistic lower numbers were to be provided to potential investors. Both the separate ”x” and “2x” numbers and the role of public records act requests in the Oregon story are eerily similar to CDM Smith’s role in the Knik Arm Crossing project. Smith has projected 36,000 vehicles would cross the Knik Bridge in 2035 and that number is key to the project’s financial plan. Two public records act requests to the Alaska Department of Transportation finally unearthed a number half that or 17,700 trips a day that CH2M Hill estimated using UAA-ISER data when CH2MHill modeled the 2035 Bridge traffic for the now indefinitely delayed “Highway to Highway” project. CDM Smith has sometimes produced “investment grade” projections of traffic and toll revenue that project operators then used to sell bonds for toll projects. However, with CDM Smith’s 118% national average overestimation rate of tolled project (see 3/9/12 post below) and an increasing number of P3 toll projects in bankruptcy with resulting lawsuits over responsibility for toll shortfalls (see below), “investment grade” traffic and toll revenue studies by the industry are increasingly rare. Unfortunately, the revenue numbers from that 2011 study were used by Citi in the financial plans provided to the Alaska legislature when the legislature debated bills to provide the project a state guarantee. There are other similarities between the Knik Bridge and I-5 projects besides sharing the same controversial traffic and toll consultant. Since both projects are proposed Public Private Partnerships (P3s) projects, KABATA officials have traveled to the Vancouver, WA-Portland, OR area to review the I-5 project. With eleven toll projects in various degrees of financial distress nationwide, copyrighted stories in the Wall Street Journal and Bloomberg last week highlighted the recent trend of bondholders and construction firms to attempt to have states to guarantee the funds necessary to make up for “unforeseen” toll shortfalls. P3s have been promoted as a way for the private sector to take the risk of building infrastructure. However, many projects are now experiencing toll collections lower than projected. As a result, private project operators and bondholders now want the states to guarantee sufficient revenue to pay project costs. The bankruptcies and financial restructuring clearly demonstrate that while state guarantees are good for the bondholders, they’re not good deals for states. The Wall Street Journal article [ This link was live as of August 2017, however viewing the article requires a login ] focuses on the recent bankruptcy of American Roads LLC, a company set up by Australian bank holding company Macquarie Group to finance construction of five tolled bridge and road projects in Michigan, Alabama and Florida. Lower than projected toll revenues led to a failed debt restructuring plan, a lawsuit between Macquarie and the company insuring the financing, and a July 2013 Chapter 11 filing. 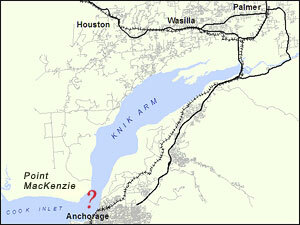 A Macquarie US subsidiary is the co-leader of one of the three consortia preselected by KABATA to build the Knik Arm Crossing, see here [ Dead link- the Kabata website is no longer online ]. In a sense, KABATA has been ahead of the recent national trend. The private consortia competing to build the Knik Bridge have consistently refused to take the risk that tolls alone would be able to finance 35 years of payments. So all bills introduced in the legislature to promote the project have contained a de facto state guarantee for the contract with the bridge developer. Two Forms for Alaska to hold the Downside Risk: P3 or Direct State Finance? If the toll revenue forecasts for P3 projects are so unreliable that they now “require” a state guarantee for sufficient revenue to pay obligations, why shouldn’t the state just finance the project directly at lower cost? That is the question financial firm First Southwest, (the former employer of newly promoted Department of Revenue Commissioner and KABATA Board Member Angela Rodell), is studying for the Department of Revenue. According to KABATA’s, the state could save approximately $600 million if Alaska financed the project directly at around 4%. That is because KABATA’s financial plans show the contractor receiving an estimated 12% annually to sell bonds based on a state contract whose payments would be guaranteed. As outlined above, the guarantee is built into the “KABATA” bills that have failed to pass the legislature the last four sessions. While a significant cost savings, direct state financing would put KABATA’s billion-dollar plus project in heavy competition to get in the state capital budget. The First Southwest report is due at the end of this month. KABATA has now acquired most of the Government Hill properties within the right of way needed to construct the Knik Arm Crossing although it has on hand only about 2% of the estimated costs of the project. Recent articles in the Anchorage Daily News (click here [ Dead link- this article is no longer online ] and here [ Dead link- this article is no longer online ]) have highlighted the fate of two Government Hill businesses, a Subway shop and Tesoro gas station that sit on land under long term lease from the Alaska Railroad that KABATA has sought. The Subway representative is quoted as saying that KABATA had no interest in leasing the business back but just wanted to demolish it. Perhaps in response to the front page publicity, at its November Board meeting the KABATA Board reiterated its efforts to acquire the land but passed a resolution so that, once acquired, KABATA would be willing to lease the land back to the two businesses so they could continue to operate until the land was needed for construction. This was not an option that KABATA has allowed in acquiring the Sourdough Hotel and three residential homes and small businesses. Contracts are now being prepared for those properties to be demolished this spring. For a copy of the KABATA press release click here [ Dead link- the KABATA web site is no longer online ].